Tarek Mansur takes you on a grand journey with enormous drums, dramatic vocals, brooding brass lines, wild sound design and pulsing synth lines. You’ll find heroism, determination, sorrow, fear and action. 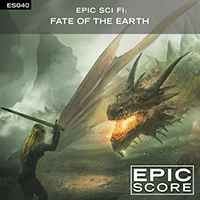 The music is presented in a full mix (A) version, a non-vocal (B), and 4 basic stems are available – Percussion/FX, Synth/Bass, Music and Vocals. All 6 versions are designed to work together, so you can line up the file starts and they’ll all play in-sync. The stems are quite useful on their own.